Yesterday, I got a call from the Audiology Department of UMass. She said she wanted to give me the rest of Garry’s official audiological follow-up appointments — as opposed to the surgical follow-ups. I had already gotten the ones for pre-op and Surgery, plus surgical follow-up. Lucky for both of us, she didn’t expect to talk to Garry personally. This is the only medical place that realized he can’t talk on the phone. As a deaf person, he can’t chat on the phone. That’s what the surgery is all about. Every other time I talk to a medical person other than our family guy, they insist on talking to Garry. I hand him the phone, shout “JUST SAY YES!” Which he does and the conversation can progress. They totally fail to have a grip on the “he can’t hear” issue. Either that or they think if they yell louder into the mouthpiece, that will fix it. 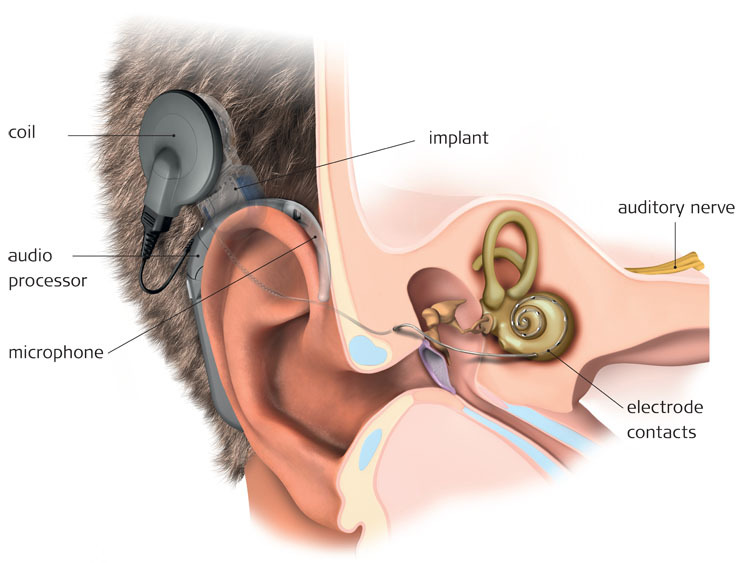 The cochlear implant is a surgical miracle and a lot of technological fine-tuning. Post surgery, he has a date for “turning on the equipment,” three more tune-ups, with a final official get-together after six months. If he needs more help or another type of help, like speech therapy, we can add those. It’s just as well we aren’t trying to do this in Boston. We’d never survive the traffic. The object of all of this? To bring Garry back into the world. To make him part of the conversation. To have him in it and not have to round it up and tell him about it later. To take him out of the enclosed space in which he now lives and bring him into the bigger world — the way he was. The way I remember him. All those objects they will put in his ear and on them? These will change him. I have a feeling they will change him more than he expects. Maybe even more than I expect. Tune in! We’ll be playing this one by ear. It’s a big step and it must be kind of scary, but it will bring so many good things back into your lives. Scary yes, but at this point, I just want to get on with it. Two weeks from today, I believe. It will be here before you know it. I’ll say a little pray for him, Marilyn. I think he’ll be fine. What will be more interesting is how long it takes, after they add the official “technology” before he REALLY hears. That particular miracle can take a few days, a few hours, or months. It’s different for each person, but I’m hoping for FAST. Good luck to both of you. Won’t it be wonderful when Garry can actually hear you? Then he’ll just have to pretend to be deaf at times, like most other husbands. Well before he really couldn’t hear me, he STILL couldn’t hear me. It’s a husband thing. They have selective hearing. We’re at that point where it has taken long enough. Now it’s time to move on. So far, we are still laughing! I hope Mr. Garry is prepared. The onslaught will be mighty. I’m glad he’ll have the opportunity of course, and think this is another miracle that most fail to appreciate. Imagine being able to actually hear! Wow. I have begun to fully realize the slow descent I’m experiencing into the land of the deaf. Two events this week made it very clear that my hearing is badly compromised and I can’t clearly hear what someone across a small table is saying. Am I going to do anything about it? Mebbee. Probably not. It’s more than volume, although volume matters along with clarity (don’t MUMBLE! ), and background noise. And it matters how seriously compromised your hearing is. If you have insurance, you should find out where you are, audiologically-speaking. It might not be as bad as you think and something small might help fix it. Insurance won’t pay for hearing aids — NO insurance will pay for it unless you’ve paid for a special rider or have separate savings to pay for it. Ironically, while they won’t pay for aids, they WILL pay for a cochlear implant. Go figure. The biggest issue is the background noise. Music in restaurants is murder on aging ears. You don’t have to be really deaf to find it difficult to hear with music in the background. Any amount of extraneous noise — people talking, traffic, clatter in the kitchen — makes hearing harder and the older you get, the more difficult it is. Worth getting things checked out. 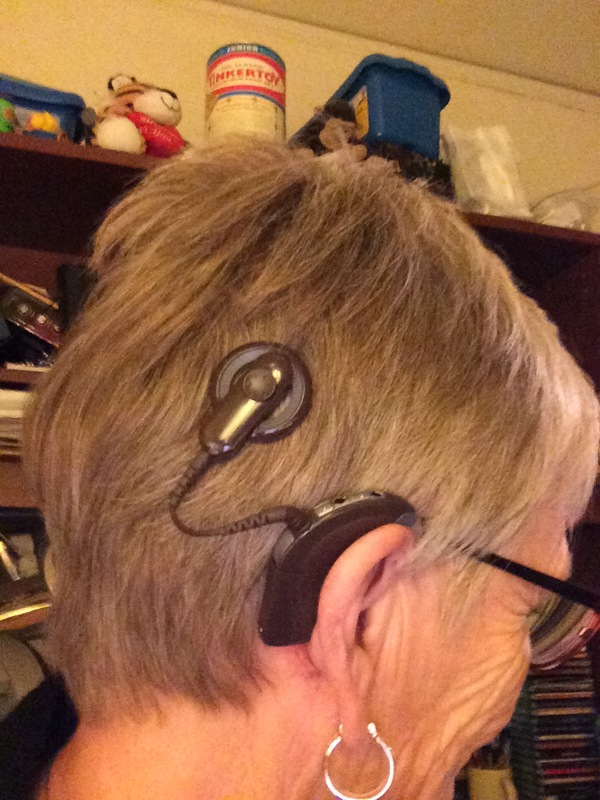 I have a mild to moderate loss and my Costco hearing aids have made a huge difference at work (no one wants their therapist squawking what ever other sentence). There also has been some recent legislation that will bring mild assistive devices into the market at a more affordable rate. 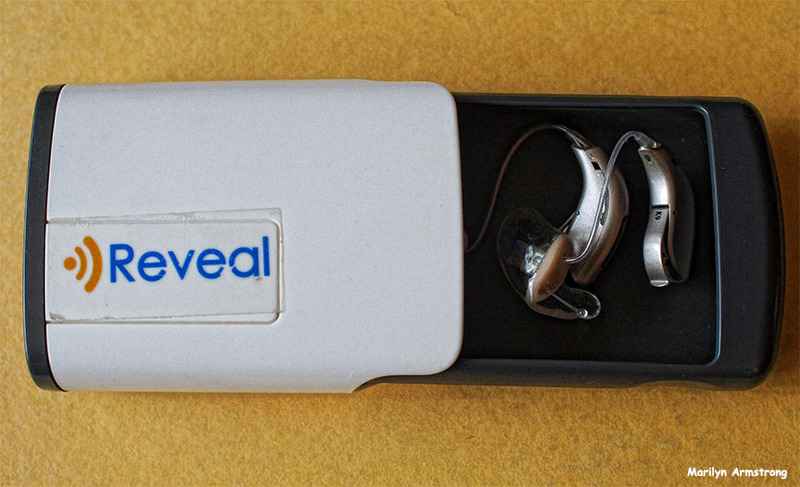 Anything that makes hearing aids more affordable would be a huge boon to so many people. It’s insane that Medicare, for example, tells you to get your ears checked, but won’t pay for hearing aids. OR eyeglasses. Or replacement teeth. It infuriates Garry’s surgeon, which is why Garry is working with them to see if they can raise some money to try and get some help for people who need aids and can’t afford them. They are wildly expensive. A good powerful pair costs like an expensive car. I understand the cochlear implant surgery will, among things, restore my responsibilty to be more involved in things like answering phones, fully participating in phone and other conversations and neutralize “what?” As part of my regular conversation. It’s a rough world. Welcome to it. Almost. You can, but they have to be programmed for BlueTooth. He won’t be able to hear a standard headphone in his techno-ear, but he can be set up to hear the phone and/or the TV on BlueTooth. It’s going to take some retraining on MY part. I’m used to letting him use headphones, but I’m the one who’s going to need headphones.